This golden sand beach is only 5 kilometers (about 3.5 miles) away from Naxos Town, easily accessible by frequent bus connection. It is a long beach, (1.5 kilometers), and is frequented both by people who want to enjoy a well developed net of beach facilities (part of it is well organized) and those who are after a totally unspoiled natural setup. 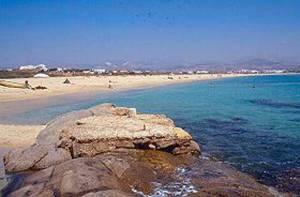 It is considered one of the best dune beaches in the Mediterranean. There is the Agios Prokopis village nearby, with lots of accommodation suggestions. This large three-star complex is situated only 4 kilometers south of Naxos Town, just 500 meters from the village center of Ai. Prokopios, and 800 meters from its beach. A nicely-sized self-catering accommodation, this complex is situated only 150 meters from the beach, and has its own swimming pool, pool bar and gardens.